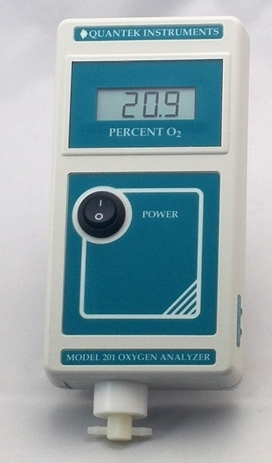 The Quantek Model 201 is a portable oxygen analyzer used primarily for the measurement of O2 concentration in gas flows, chambers, or gas flushed hoods (such as glove boxes). The analyzer comes with both an “open faced” fitting and a T-fitting, allowing it to be used for analyzing gas flows, or set in chambers where oxygen levels need to be monitored. Please provide as much information about your application so we can assist better. Customers in Australia and New Zealand please provide a phone number.